I spent today taking the kids to their grandparents. We took the Queenscliff ferry and the day was gorgeous, sunny warm and calm- sensational really. But I left my camera at home so I can't share the gorgeousness of the day- the beautiful aquamarine colour of the sea, the cheeky seagull catching a ride on the ferry all the way ( it takes about an hour), the dolphins playing in the water alongside the ferry and just the pleasantness off the landscape still clad in its summer colour. And tomorrow I drive to Mossvale about a ten hour drive or more to teach for four days. But I said something new- some of you may already have it but Marion Barnett and I have worked on a lutradur work sheet and you can email for it by clicking on the link. We are also going to write a book- once my feet are a bit more on terra firma after the European trip, though I intend to do more work with the lutradur leading up to Europe. 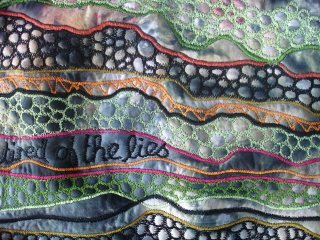 So I did turn on my sewing machine and did thread it and did sew- just lines and pebbles of colour- and whilst i was sitting and sewing I thought about all I had seen, and really how different it was to what the media would have us believe it is. Basically I think that we are lied to every single day. All of us are brought up to be truthful and to treat others with respect- I know the people I have as friends are such people-truthful, respectful, compassionate and caring, but but where is this in the people that seem to run the big things? 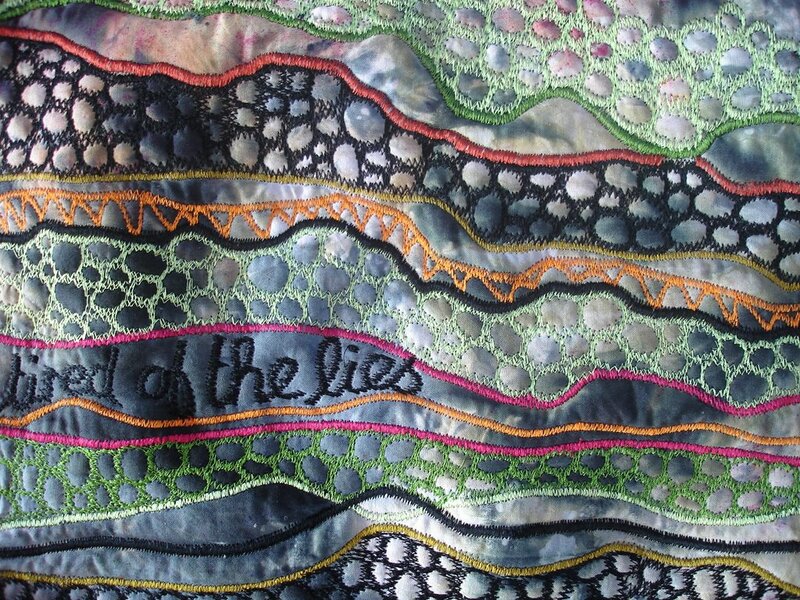 They smirk and tell another lie, defraud and tell more lies- and frankly I am tired of being lied to- hence the writing on the stitched piece. Not only that, the lies result in people dieing- and that deeply bothers me. It leaves me feeling wretched with powerlessness- that it has got so, that there seems so little that any one person can do- so the wheels grinding in my head are saying that perhaps i can say more with my art. 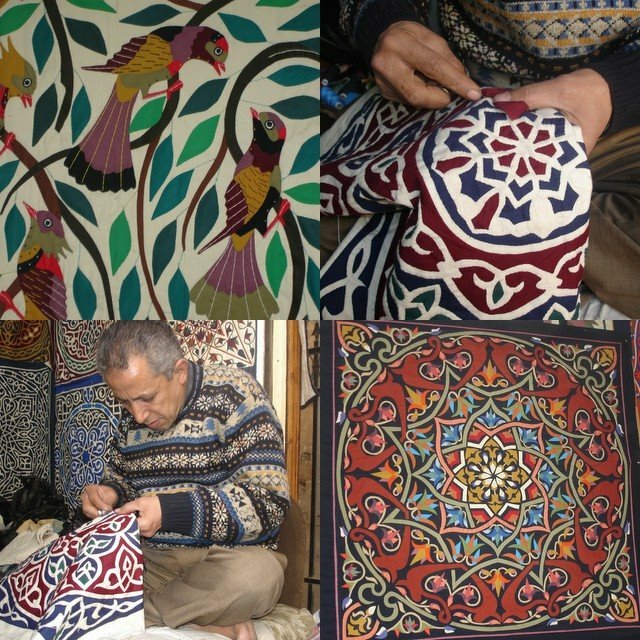 I encountered a Syrian calligraphist and sculptor and artist, Sami Burhan when we were in Allepo. He lives in Italy most of the time but Allepo is still his home. He had created work for the United Nations, and all of his work involved the concept of peace and brotherhood- I can see the some artists, those in power and the 'me' generation laughing with superior smirks about such an outdated notion- but he believed in it firmly- he acted it in his dealings with people and students- he was generous with his time and thoughts and it was there in his huge sculpted art. 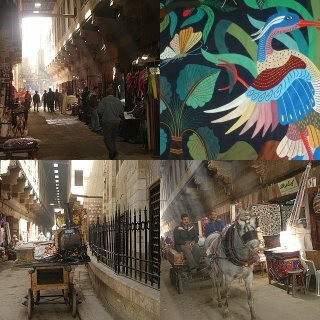 He was using the beauty of his calligraphical heritage to make large statements, and i thought here is a voice in the wilderness- we need more of those. Where did the good intention go? The intention was to hit the deck running and be sewing on a quilt by now- but it hasn't happened. First of all children are on school holidays and there has been various catch-up running around to do and then well inspiration seems to be in the bottom of my toes- certainly not in the souls of my feet. 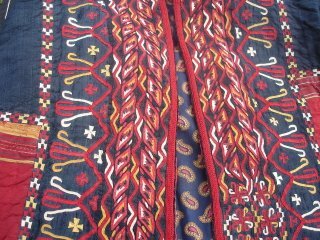 So i thought I would show some details of two embroidered capes/dresses I bought. 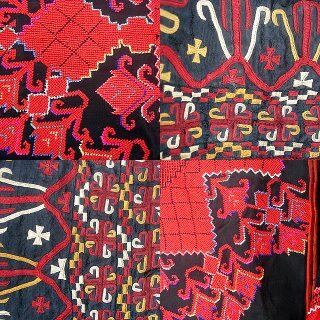 The cross-stitched red and colours on black is a Palestinian dress- I love the density of the stitching. 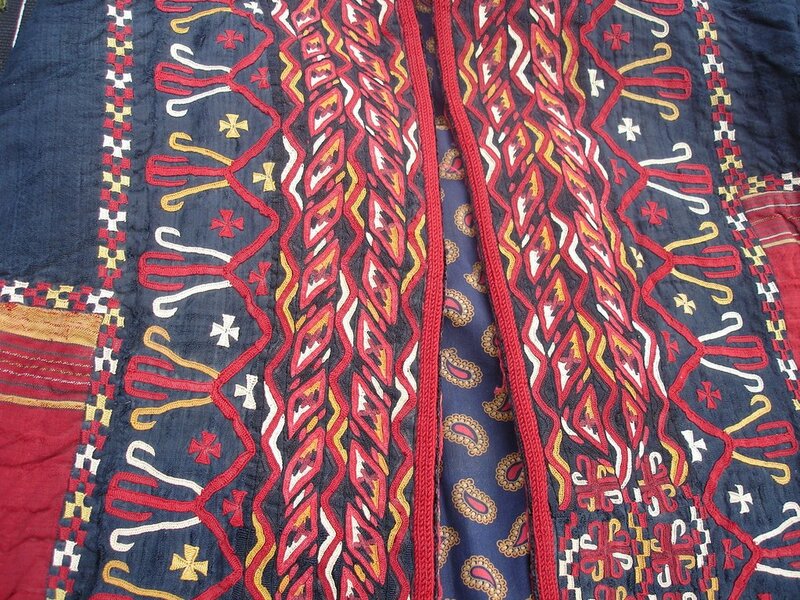 The second is a cape from turkestan (i think...) i can't remember, i was too excited and in textile heaven where I bought these things- it is on indigo cloth and embroidered with button hole stitch and has the pleasing patina of having been worn. I always wanted to create a series of interactive capes- that someone would put on in the exhibition space ( i know yes they would get grubby) but I love the idea of somehow recording how the cape/cloak would make the person feel when worn- would a person wear it? and if so would it alter the way one felt? 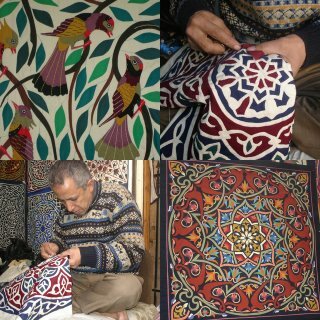 I know when I went to this textile shop in Damascus it took my breath away( and we went there nearly every day)- the colours were so rich and wonderful that i didn't know where to begin- had I been my cat I would have been purring and dribbling in bliss at the same time, but as i was human I just feasted on the colour, the lusciousness of the textile, the attention to detail, the rhythm and pattern of the stitches- the sheer utter joy of something so beautiful. I am back and finally a bit recovered from the homeward journey. 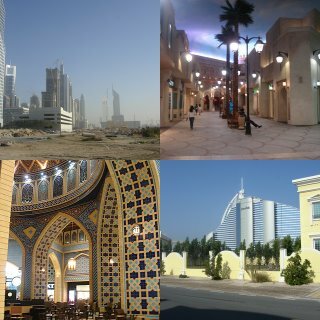 Leaving Dubai at 2.45 am after earlier that day having flown from Kuwait and arriving in Melbourne at 1.45 am is not my idea of fun. The last two weeks have flown by and are full of juxtapositions- from the dust and dirt and charm of Bub Zwela and the tentmakers where we spent our last day in Cairo and where I purchased some cushion covers ( 6 to be exact) from Mohammed who does lovely fine designs to the new kitsch and glitz of Dubai where everything can only be said to be big- shopping centres are big and one even has a ski slope, where an island has been built in the gulf to accommodate the worlds only seven star hotel where all that glitters really is gold( however the building in which it is contained is very interesting and is indeed a landmark on the coastline). 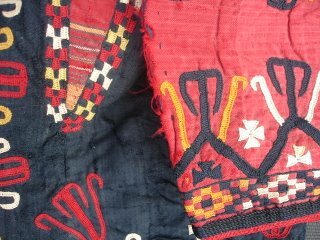 When I started my blog I called it the musings of a textile itinerant and the last 7 weeks has indeed been the encapsulation of that- now i am home for five weeks and then I am off again to Europe to teach in Spain near Girona, and the South of France before heading up north and the Netherlands. 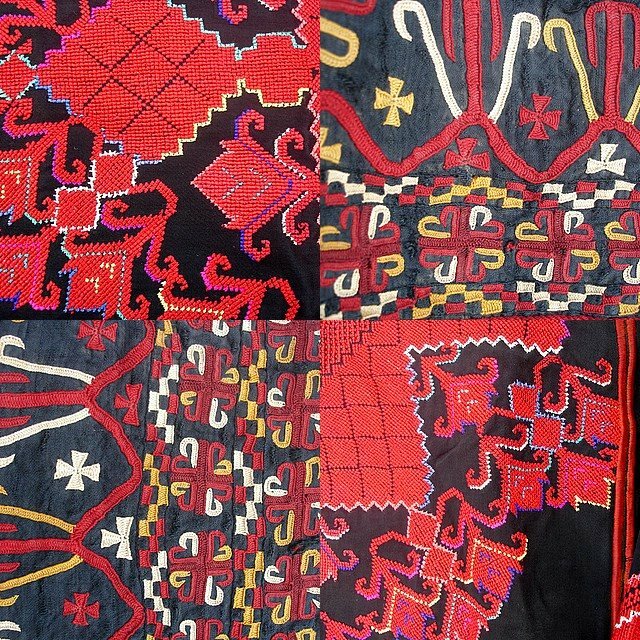 There are some other possibilities floating around that need to be finalised in the next week or so plus I have to make a number of new quilts. And then there is next year- I have been invited to bring another exhibition of Australian work to Syria and Damascus for a three week period March 2007, and Oman has been put on my wish list to see- I heard many wonderful reports about it. My daughter Celeste who came with me this time is thinking of ways to save money so that she can travel to this region again because we really had a fabulous time and there is so much to see, and well the jewellery and textiles are stunning- we have lost so much - for me fine craftmanship and a richness of decoration are surely one of the beautiful things you encounter in life's journey and a life devoid of it is all the poorer for it.